After the heavy days in April and May 1979, Daisaku Ikeda moved out of the president’s office at the headquarters building, and began to use offices at Tachikawa, Toshima, and Kanagawa Culture Centers. The priests had demanded that he not speak at big meetings or give guidance to members. The Seikyo Shinbun was forced to stop publishing Daisaku Ikeda's guidance or even a photo. The impression was that he no longer existed – he was even discouraged from traveling around Japan. 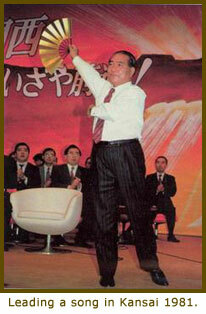 Because he could not speak at meetings, Mr. Ikeda found other, nonverbal ways of encouraging the members. 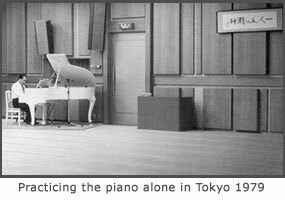 He would often play the piano or lead a song using a fan.